Assistant Professor and Head, Department of Real Estate and Department of Commerce of Daffodil International University has visited the first university of Canada which is Laval University Canada. It is to be mentioned that Laval University is the first Francophone university in North America too. Delegates from almost 100 countries have joined the 20th CEDIEMS conference on 7-12 November 2010 Laval University, Quebec, Canada, the first Canadian University and first Francophone University in North America. It is a matter of pride for all that, one of the representatives from DIU, Mr. Masud Ibn Rahman, Assistant Professor and Head, Department of Real Estate and Department of Commerce, Faculty of Business and Economics of DIU took part in this world class International Conference and glorified the image of the country and DIU. Mr. Rahman had been selected as the speaker of the Stephen A Jarislowsky Chair competing India, China, Malaysia, Indonesia, Thailand, Vietnam and many other Asian countries. It is worth to mention here that Canadian broadcasting service Radio Canada broadcasted the interview of Mr. Rahman as an expert from Asia. It is expected that researchers from more than 100 countries will be joining the conference. Resolutely committed to the highest standards, Université Laval provides all the resources to help you succeed in your studies and launch your career. speak two and half hours instead of scheduled 50 minuites because of the interest of academicians and researchers as well as students of Laval University which was beyond the imagination of the presenter. He also met the press to talk about this issue. Following is the link of their university web site where they have published good narration about Mr. Rahman. Mr. Rahman is optimistic that, CDC of DIU is going to get at least one student per semester from Laval University for internship placement at some reputed organizations in Bangladesh. He had a meeting with the director of exchange program of Laval University where Mr. Rahman tried best to explore the name of DIU. 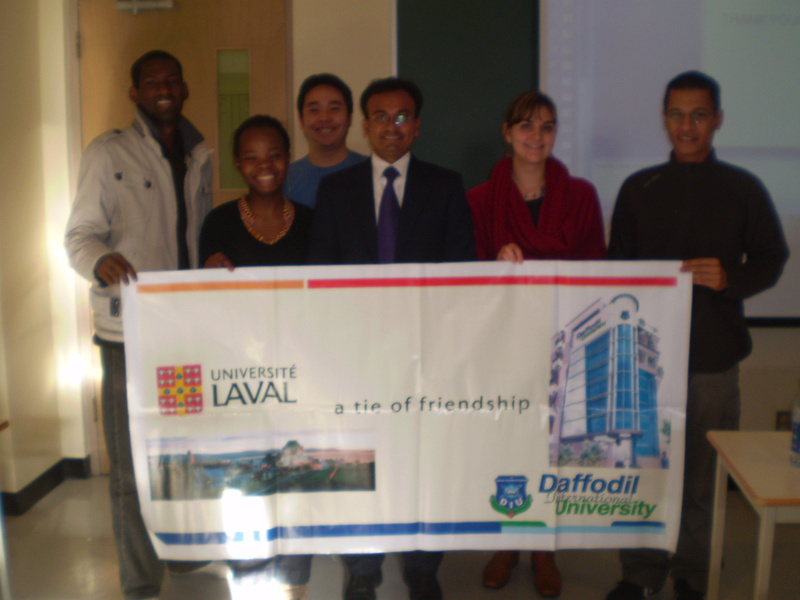 Thanks to Mr. Masud Ibn Rahman for establishing a bond of friendship between Laval University Canada and Daffodil International University. We are proud of Mr. Masud Ibn Rahman and greatly thankful to Laval University for this friendly bond. This is indeed a valuable achievement for us.